Gain Access To The Same Knowledge And Reference Used By Leading Law Enforcement Agencies, Criminologists And Top Law Firms! 7th edition 928 pp., 6 x 9, 76 il. Now in it's 7th edition, this excellent work has been hailed as the world's best authority on the subject of criminal investigation and is used by leading colleges, law enforcement agencies, criminologists and top law firms since 1956. 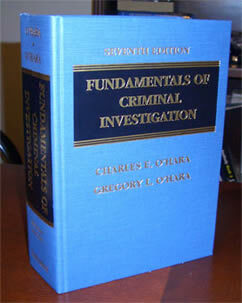 In 928 pages, this hallmark standard covers almost every known segment of criminal investigation. From crine scene investigation to searching for information-from the care and procurement of evidence to expert techniques for interviewing and interrogation-and from high tech scientific forensic methods to specific types of criminal cases-this work is an overwhelming and extensive knowledge base of criminal investigation like no other. Every conceivable method of criminal investigation and evidence collection is covered, indexed and referenced to hand you the extensive knowledge you need to conduct various types of criminal investigations.